The kids are currently home from school because we are stuck in the middle of a snowstorm. I have a confession. Even as an adult, I love the notion of a snow day. There are no expectations for any of us to leave the house and it feels so cozy and snug to lay around all day with the kids on the couch. This is my last post for the day and then I am calling it quits until tomorrow morning. Before I do, I wanted to give you my quick recipe for french toast. I’m not someone who makes a lot of big breakfasts even though it’s probably my favorite meal. French toast only comes out when there is a storm. LOL! I don’t know why. I am one of those people!! Today, we made almost a full loaf of Italian bread and it was SOOO GOOOD. It’s ok to indulge every now and then, right? Here’s the recipe in case you are looking for something sweet. Warm your pan on medium heat and put a few cubes of butter. I’m telling you right now, I use a lot of butter. So, just use what you think is right. Crack three eggs and mix in a bowl large enough to dip your bread pieces in. I used the red plate pictured above. Add the milk, vanilla, and cinnamon. Mix through. 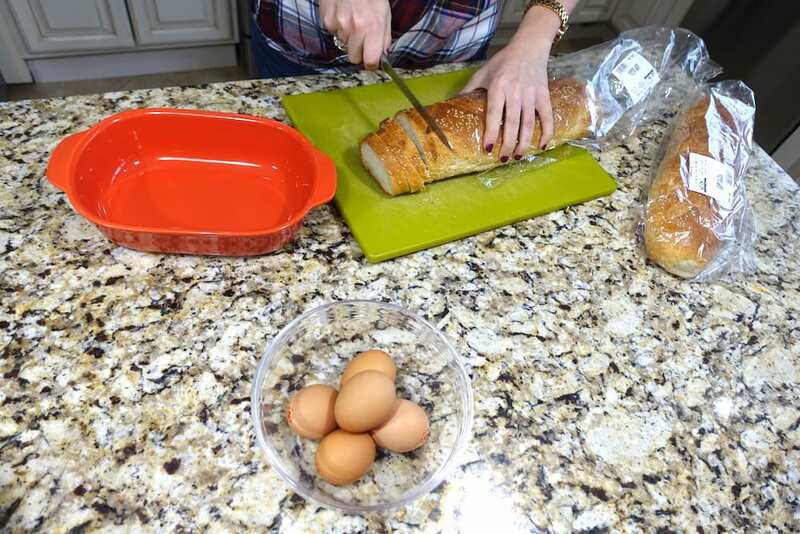 Cut your bread as wide as you’d like them to be and dip into egg mixture – both sides. Place on pan and cook through until golden brown. Repeat. Place new cubes of butter before adding new bread to your pan. Top with your favorite syrup and if you’d like, sprinkle some powdered sugar before serving. PS, if you like my top, you can get it in three different colors here!! Francesca’s is one of my favorite stores. They always have such incredible deals going on!